Most of us have had at least one slice of this iconic food, which can be traced back to the late 16th Century. After receiving tomatoes from the Americans, the Europeans incorporated this ingredient into a dish that would be known as pizza. Raffaele Esposito, a native pizzamaker of Naples, created the “Pizza Margherita” in 1889 to honor the Queen consort of Italy. Fast forward to today and multiple studies have been conducted on pizza and how safe it is to eat. There appear to be interesting links between pizza and gout that will make even the most avid pizza enthusiasts think. It is no secret that many kinds of pizza are not suitable for those who suffer from gout, mainly because of various meat toppings that go against a diet of little to no purines. However, there are ways to make pizza work for you as a healthy food as it is a matter of adding the right ingredients to it. A single slice of 12-inch pizza dough contains 136 calories, 25 grams of carbohydrates and 2 grams of fat. In some pizza dough recipes honey is included, but that is a very small amount of sugar that amounts to 1 or 2 grams in one slice. 5 grams of protein are also found in whole wheat pizza dough. Except for Vitamin B12, all of the B vitamins can be found in whole wheat pizza dough. B-6 and folate, two key vitamins in pizza dough, lower homocysteine levels in the blood, which can reduce the risk of cardiovascular disease. B vitamins are water-soluble, meaning they will not accumulate in your body’s fat tissues and will be quickly flushed out of your system in the form of urine. One sure way of having gout attacks be an issue in your everyday life is if your body is lacking in Vitamin B. By eating pizza you are helping yourself avoid experiencing mental and emotional setbacks such as stress buildup, which is known to deplete Vitamin B5. It is heavily assumed that eating pizza every day leads to considerable weight gain. However, one study suggests that the exact opposite result is more possible. This study had participants placed on a diet that was limited to around 10,500 calories per week, and half of all participants were allowed to eat anything they wanted one day per week. After two weeks both groups had experienced weight loss, but the group that was given one day off their diet were happier and remained motivated to continue their diet. Gout-sufferers can find creative ways to make pizza a safe and healthy food to eat. Take this recipe for an eggplant parmesan pizza for example. Total preparation time for this meal could take up to 4 hours. Ingredients include ½ a cup of olive oil, 4 medium-sized Japanese eggplants, 5 teaspoons of minced garlic, and various kinds of cheeses. The oven is preheated at 450 degrees. Brush the parchment of a rimmed baking sheet with the olive oil, and cut the eggplant into ¼ inch slices. These slices are placed on a single layer on the baking sheet. The eggplant slices are roasted until golden brown, which would normally be around 30 to 40 minutes. The slices are flipped midway through this process. Though this recipe features tomatoes, which may or may not be helpful for gout-sufferers, you will always have the option of substituting this ingredient with something else. It is possible to make a pizza without having tomatoes as an ingredient. One topping that can be included in a pizza recipe that is safe for gout-sufferers to eat would be pineapple. Being rich in Vitamin C and bromelain, a chemical compound used specifically to treat gout, pineapple slices on your custom made pizza would be wise. Eating pineapples helps reduce inflammation. Another ingredient to consider as a pizza topping would be cherries. There are ways to incorporate cherries in savory dishes like pizza. Whether tart cherry juice or slices of cherries are included, the presence of flavonoids in this fruit help reduce uric acid levels in the body. The key to making sure pizza and gout don’t go together for the wrong reasons could be in your choosing of toppings that are low in purines. Uric acid is formed when the purines in food are broken down in your body. Crystals shaped like needles will form in your joints, and it will eventually lead to aggravating pain. Foods low in purines only produce around 100 milligrams of uric acid per 100 grams of food. Beets, cucumber, lettuce and kale are all good examples of low-purine vegetables. While there are safe ways to make pizza a healthy enough food to eat, the warning signs are obvious with one familiar ingredient seen on most pizzas. Research from the University of Otago in New Zealand suggests that eating tomatoes can cause gout flare ups. 2,051 native New Zealanders that had gout were surveyed, and 71% of this group reported having one or more food triggers. In 20% of these cases tomatoes were listed as a food trigger. According to Tanya Flynn tomatoes ranked as the fourth most commonly listed trigger. Seafood, alcohol and red meat were ranked above tomatoes. Researchers found that the significant connection between the consumption of tomatoes and uric acid levels was on par with the food triggers ranked above it. According to “Eat This, Not That!” pizza happens to be the second largest contributor of saturated fats to the average American diet. Saturated fats are enemies of your heart as they can significantly clog your arteries over time. After eating a slice of pizza the carbohydrates will break down into sugar, and the fats that come from cheese, pepperoni and various other toppings will help slow the digesting process down. If you have a gluten or lactose-related sensitivity it may be an initially uncomfortable digesting process after eating pizza. Depending on how many slices you eat, your blood cells may not want to soak up all the sugars, which can cause spiked blood sugar levels. The causes for someone obtaining health conditions such as obesity, cardiovascular disease and diabetes include foods that have too much saturated fats, too much salt and too many calories in the diet. It is suggested by the American Heart Association that people take no more than 5% to 6% of their daily calories from saturated fat, which is around 13 grams per day for a diet of 2,000 calories. Saturated fats are found in foods that hinder gout-sufferers such as red meats and animal-based foods, and these fats can raise your bad cholesterol levels, making you vulnerable to developing heart disease. Considering this information, the links between pizza and gout should be considered significant. 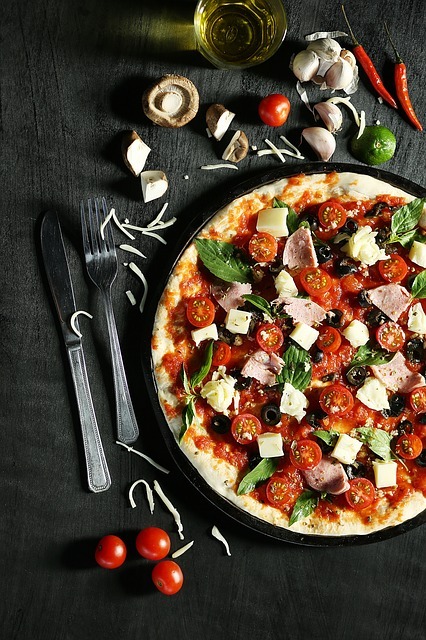 Pizza and gout are certainly familiar with each other, but there are ways to make your experience eating pizza a healthy one, and an experience where your uric acid levels won’t suffer as a result. If you are not a fan of certain pizza toppings because they can possibly increase your chances of having gout attacks, then you can simply substitute other ingredients in their place so that you can stick to your regular diet. Everything comes down to the preparation of your custom pizza. The more meaty toppings are not ideal for your consumption due to their high purine levels, but incorporating fruits and vegetables as toppings would work beautifully. In fact by reading materials such as the e-book Gout and You: The Ultimate Gout Diet and Cookbook you should be able to develop a solid game plan and maintain a healthy diet to keep your gout situation in check.